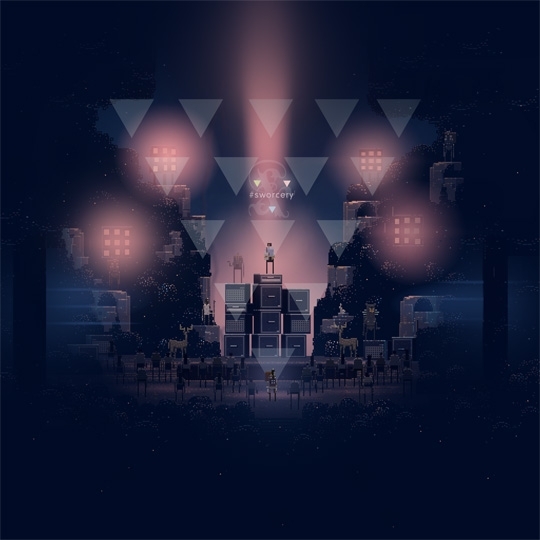 Superbrothers: Sword & Sworcery EP is the latest indiecool thing under $10 to tell all your friends about. It's a game that defies description the same way someone's favorite experimental band evades labels. The best summary offered so far comes from the developers themselves: S&S is "an album you hang out in." S&S has much more in common with an inscrutible prog rock album than a video game, which would be far more interesting if the gameplay were as engaging as the sights and sounds. Since neither the developers nor the promotional material offer much of an explanation of what S&S is, my own interpretation is that it's a quaint story of martyrdom and morality. I do mean "quaint" as S&S is full of big ideas stripped to the bones and neatly ground to a fine dust. After all, the game was originally designed for quick consumption on iDevices. The dialogue approaches life-and-death topics with the severity and emotional impact of a stoner on a stream-of-conscious tweet frenzy. Every line of text is intentionally under 140 characters so that players with a linked Twitter account can tweet back to the real world. Since everything nowadays has to have a Social Media Experience grafted onto it, the Twitter integration is just perfect for a game as Indie-Canadian as this. I love telling twits exactly what I'm doing whenever an online service enables me, but I never saw the purpose for this feature other than to spam my followers' feeds. What I get from S&S is a game full of "artistic vision" with uneven degrees of realization. The most fully realized element of S&S is easily Jim Guthrie's soundtrack. 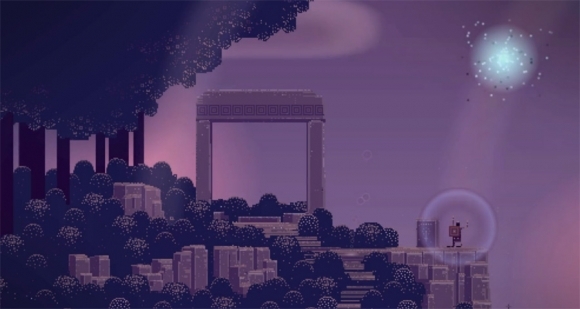 It can stand alone from the game and succeeds in crafting a journey experienced through sound. The greatest incentive to play S&S is simply hearing more of the soundtrack. Visually, if you aren't sick to death of the pixel art scene by now, S&S impresses with how much it conveys with so little. Every pixel in S&S's minimal color pallete is masterfully placed, resulting in environments that are worthy of creating a series of desktop wallpapers from. The characters in S&S are mostly nondescript and would be easy to forget if there weren't only a handful of them in the game (plus they all have well-defined roles). Despite being clusters of dull-colored pixels, all characters are well-animated, particularly the player character, whose appearance degrades over time. The one thing I can't stand is the way characters' knees bend when walking. No amount of artistic license can excuse how painful it is to watch and imagine in real life. Now that all the interesting bits are covered, I have to dig into the disappointing gameplay. This isn't supposed to be a compliment, but S&S's gameplay is reminiscent of Killer7. As tight as the art direction in S&S is, it's miles away from Suda 51's exhuberantly psychotic masterpiece. S&S isn't pleasantly insane enough to forgive the rudimentary and repetitive combat against a grand total of three enemy types, two of which are there to spit up an item or some dialogue. Action sequences are broken up by long periods of on/off linear movement and puzzles ranging from super simple to "whoops I didn't scrub my light pixie cursor on a specific piece of the environment, guess I'll wander aimlessly for an hour." I hesitate to call the two-button control scheme a thing of beauty, since taking the mind off of actions such as combat and movement reveals how unengaging a game can be when the effort is removed from the clicking. Even if you aren't the smartest person, S&Swill probably only take four hours to complete, yet all the uneventful backtracking makes it feel much longer. There are moments that made me go, "hey, that was pretty sweet for an indie game," but the highs punctuate the low-key experience only rarely. Sword & Sworcery is a sometimes interesting art game that's gotten way more hype than it merits. It's a well-crafted bit of work that's put too high on the pedestal by its Proud Parent developers and an easily excitable circle of gaming journalists. For all of the pats on the back received in my brief adventure through the woods of S&S, I didn't feel like I was involved in anything truly remarkable. It might have been cute at first, but a heavy atmosphere of Zelda worship prevents S&S from developing a proper identity for itself. I'll recommend the experience solely for the soundtrack, but I can't guarantee that S&S charms as well as its extensive collection of Game Design Awards would lead one to believe. At the very least, it's not another quirky platformer with a physics fetish.